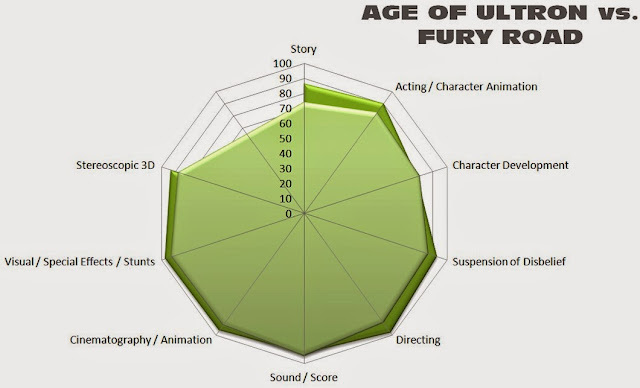 MarketSaw - 3D Movies, Gaming and Technology: Movie Review Head to Head: AGE OF ULTRON vs. MAD MAX !! 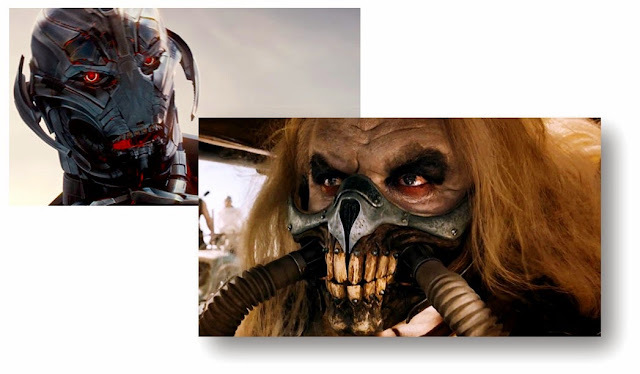 Movie Review Head to Head: AGE OF ULTRON vs. MAD MAX !! Why not? A couple of awesome 3D converted movies compared head to head! I really wanted to see AVENGERS: AGE OF ULTRON a second time before doing this but didn't have the time yet so instead of waiting to see both again, I'm giving it a go now. Yes, they are both second view worthy. Very much so. However, MAD MAX: FURY ROAD is a downright classic, while AGE OF ULTRON doesn't measure up to the original Avengers movie. So which one came out on top? Definitely MAD MAX. ULTRON has some very cool elements don't get me wrong, but I get the strong feeling that director Joss Whedon was severely curtailed in what he could deliver on vision for the project - Marvel is known for that. In this case, they need to smarten up. George Miller on the other hand seems like he had carte blanche to explore his vision and explore he did! A stunning accomplishment. I found the 3D conversion to be acceptable for both movies, but FURY ROAD had the flexibility to expound a crazy new world and the exaggerated 3D at times worked tremendously. Only saw a few shots where the 3D was shoddy and frankly lazy. It helps that I know what to look for but this was obvious (detail around moving fine lines for example). Definitely see MAD MAX in 3D on the largest screen possible. Same goes for ULTRON but the 3D there is much more muted and if you like seeing and being reminded that you are watching a 3D movie over and over again, then MAD MAX is for you. For me, there is a time and a place for using extra depth and FURY ROAD is it. Trust me. I thought both movies suffered somewhat from storylines that did not justify the immense time, effort and money that went into them. ULTRON was not a good enough villain to throw at the Avengers (hard to follow up after Loki but still...), the movie seemed invented rather than "fate" for the team and character development is all but at a standstill with so many characters in play now. However FURY ROAD had practically no character development either and if it wasn't for the odd quote of "redemption" or lightning quick flashbacks there would be none at all. But MAX had proper villains, better acting, better practical effects (which make a huge difference) and was just stunningly gorgeous in its bleakness. You have to see it to believe it. I'm not going to spoil either movie for those who haven't seen them yet (but we can spoil in the comments - so fair warning! ), but definitely see them both. This is a comparison between two amazing movies, but its just that MAD MAX is an instant classic and is really artwork. It belongs in the Louvre. Seriously. It's as if Tarsem Singh, Michael Bay, James Wan and well, George Miller all got together and painted a moving masterpiece. Bravo Mr. Miller - you've grown your game even though you've been around for an amazing career.